If you’re ready for some winter fun that doesn’t involve, slopes, ski lifts or snowboards…you may want to check out The Millworks in Harrisburg. The site is the old Stokes Millwork and has been transformed, using reclaimed lumber salvaged from the building, into 24,000 square feet of artist studios, restaurant, bar and beer garden (in warmer weather). The studios house over 30 artists with disciplines in many different areas including painting, pottery, jewelry, textiles, design…many of whom can be found at work on site at any given time. The restaurant makes use of local ingredients available at various times of the year..with at least half of their menu offerings coming from the wood-fired oven. Their local approach extends to the bar as well…artisan cocktails, original and barrel aged, are all made with Pennsylvania spirits. Twenty Pennsylvania beers and ciders are on tap and the wine list includes local and international varietals. Live music figures largely into the overall atmosphere of the place…if you’re into Indie pop bands, Lower Dens will be making an appearance in January. 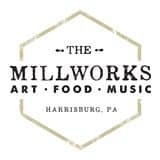 Please visit The Millworks website for photos, artist information, restaurant hours, upcoming events and much more. Book now at 1825 Inn Bed and Breakfast right next to Hershey PA…there’s always something new at the Inn!